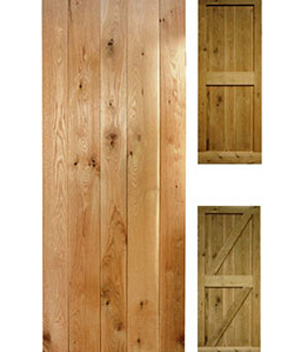 Aesthetically pleasing, solid oak doors are natural, sophisticated with an elegance of beauty and charm. Each piece of solid oak is unique and has a personality all of its own. If our style of solid oak ledge and ledge and brace doors does not suit your requirement but you still would like the beauty oak gives, we offer an alternative to the solid oak ledge and brace door with a standard range of engineered oak doors which have an oak veneer top layer. There are many styles available to suit your needs. Please call for a catalogue. Below are just a few examples that provide an alternative that would be ideal for that barn conversion, New build, or just a re-fresh to your home. Please call to discuss your requirements and to get further ideas. We are continually adding new styles of oak doors to our range.Now available manufactured to your order is the Framed Farmhouse not to be missed. Call for details.